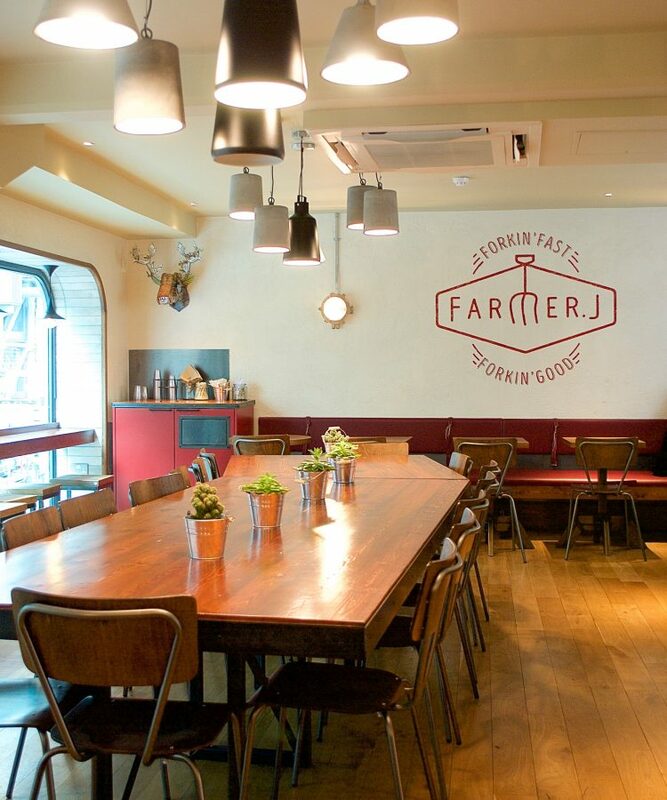 Situated in Leadenhall, a 10 minute walk from London Bridge, Farmer J is bringing a whole new meaning to healthy eating on the go. Their offerings include a delicious round up of sweet and savoury breakfast bites, from coconut porridge and smashed avo on toast to shakshuka and harissa spiced omelette rolls. But it doesn’t stop there; delicious soups and salads are aplenty. Ok, let me tell you about the field trays. This is where Farmer J really stands out. It couldn’t be simpler. Each field tray includes a protein rich main, a grain, two sides and a sauce. First: Choose your main. There’s a huge variety to choose from, including: miso chicken, harissa chicken, tofu steak, turkey meatballs, roasted sea trout or charred flank steak. Second: Add your grains or leaves. Here you can choose between baby spinach, brown rice or freekeh. Third: Add two sides. This is where the field trays really shine- there are so many delicious options! My top picks include: the roasted parsnip and cavolo nero, olive oil and herbs, the Brussels sprouts salad with olive oil, za’atar, lemon and feta, and the kale ceasar salad with anchovy, toasted seeds and egg. YUM! Lastly: Pick a sauce! Here you can choose between red pepper, chimichurri, or tahini and lemon. Vegetarians don’t need to miss out, either- the Veggie Tray allows you to pick any three sides plus a grain and a sauce. Win! After many minutes of indecisiveness, I finally decided on the grilled miso chicken with lime, coriander, chilli and ginger, the brown rice with lemon, EVOO and herbs, the grilled broccoli with tahini and tamari, the roasted beetroot, onion squash and thyme, and the punchy red pepper sauce. Unsurprisingly, it tasted fantastic. I felt like I was eating the kind of healthy meal I love to cook at home- but prepared by someone else! What could be better? The chicken especially stood out for me- the blend of miso, lime, coriander, chilli and ginger was the perfect compliment to the tender and flavourful chicken. Looking for healthy eating spots further afield? Check out my Auckland travel guide! Andrew ordered the marinated and grilled harissa chicken, the freekeh with lemon, EVOO and herbs, the asian slaw with red cabbage, lime, chilli and mint, the roasted sweet potato with Ras El Hanout and the tahini and lemon sauce. The freekeh was so flavourful and zesty, and the red cabbage slaw was a meticulously crafted blend of Asian flavours. Breakfast, lunch and all day snacks can all be snapped up for less than £5- bargain! For a field tray, prices range from £6.50- £8.25 depending on which main you choose. The veggie tray is £6.50- all very reasonable prices considering the amount and quality of food that you get. Farmer J is not a fine dining restaurant, and for this reason I didn’t visit with unrealistic expectations of 5 star service. In spite of this, it was lovely to find that the staff make you feel so welcome and are quick to help you decide what to order by recommending their top picks from the menu. I loved that they all seemed to be happy and having fun with their work, too. All in all, I can’t recommend Farmer J enough. If you don’t have time to meal prep but still want to ensure that you eat a healthy, balanced meal when out and about, this is definitely the place for you. The central location is just a bonus. What are you waiting for?! What are your favourite healthy eating spots in London? Comment below- I’d love to add to my list!